Handoff is a really great feature of modern versions of Mac OS X and iOS that allows a Mac user to pass off or resume an app session to their iPhone or iPad, or vice versa. For example, you can start typing an email on your iPhone, then pass it off to your Mac and finish writing that email or send it off. Or if you’re reading an article in Safari on your Mac and need to rush out the door, you can quickly hand it off to your iPad and read the rest on your horse as you commute to the office. There’s a lot of potential with Handoff as part of the broader Continuity experience, and it really aims to bring greater productivity to those who have an array of Apple devices. To use Handoff, you must have the latest version of Mac OS and iOS on your devices, all Macs, iPhones, and iPads must be logged into the same iCloud account, the devices must be on the same Wi-Fi network, and they all must have Bluetooth 4.0 hardware that supports the feature. For some Macs that don’t officially support Handoff, this unofficial modification can make it work anyway, though some devices would require a new Bluetooth module which makes it somewhat impractical. That’s the basics to get Handoff enabled on a Mac and iOS (remember, the minimum requirements are the Mac running with OS X Yosemite and the iPhone / iPad running with iOS 8.1 or newer), so once you have that setup let’s trigger the feature and pass a session between two devices. 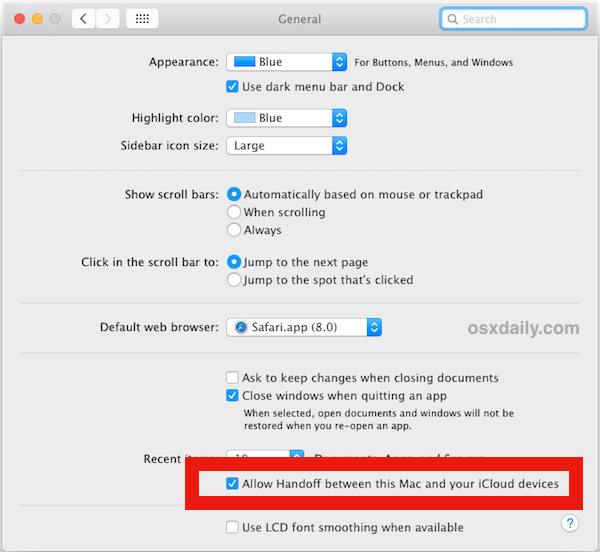 Using Handoff requires that the applications support the feature, and many apps that share iOS and Mac OS X versions do, including Safari, Mail, Pages, the iWork suite, etc. 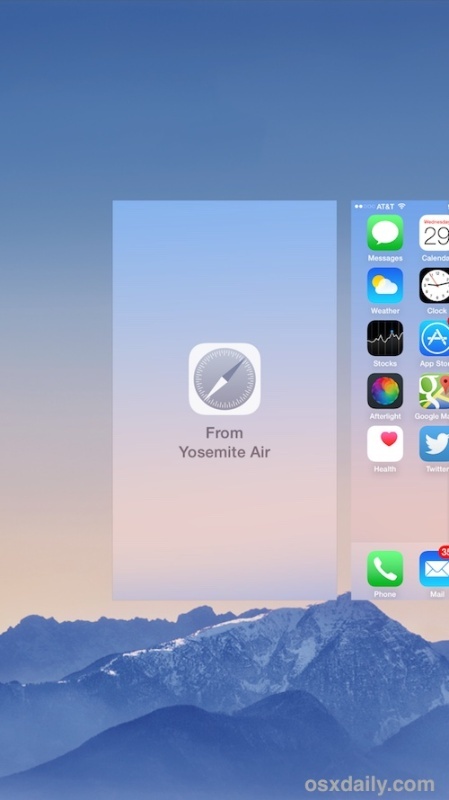 More apps will support Handoff as time goes on too. For the example here, we’ll use Safari that is being passed from a Mac to an iPhone, but the basic idea is the same for any other supported app or device too. If the iPhone or iPad is already unlocked, you can find Handoff in the multitasking screen where you’d typically quit apps that you don’t want running, just swipe all the way to the left to find the Handoff option. 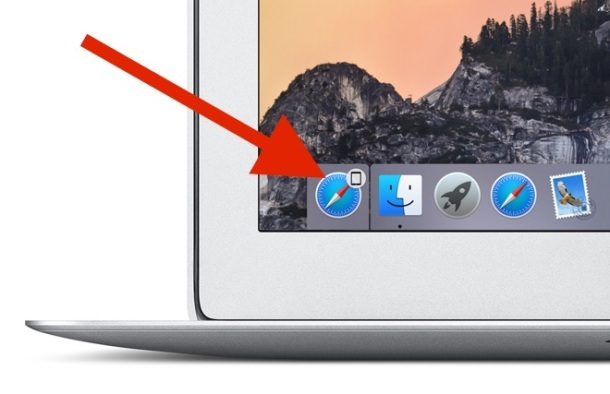 This may be obvious, but the Handoff icon shown will represent the app that is active that wishes to pass off the session to the other device, meaning you’ll see the Safari icon for a Safari session, Mail icon for an email session, etc. Triggering Handoff can be a bit tricky sometimes, we’ll touch on that in a moment. Having tested Handoff considerably, I have mixed results. On one Mac it works almost all the time going in either direction (passing a session from iOS to MacOS X or vice versa, about 90% success rate), while on another Mac I can get it to work about 50% of the time when going from a Mac to iOS device, but only about 30% of the time going from iOS to Mac OS X. For the latter scenario that’s obviously a pretty high failure rate, but we can almost certainly expect this great feature to become considerably better and more reliable as both iOS and OS X receive further updates and bug fixes. Oh and for what it’s worth, there are many users who have reported that Handoff didn’t work initially, but the feature magically starts working spontaneously and seemingly out of the blue without having changed any settings. That even applies to some of the Macs that are using the unofficial Handoff enabler tool for otherwise unsupported 2011 model MacBook Air and Mac Mini computers. 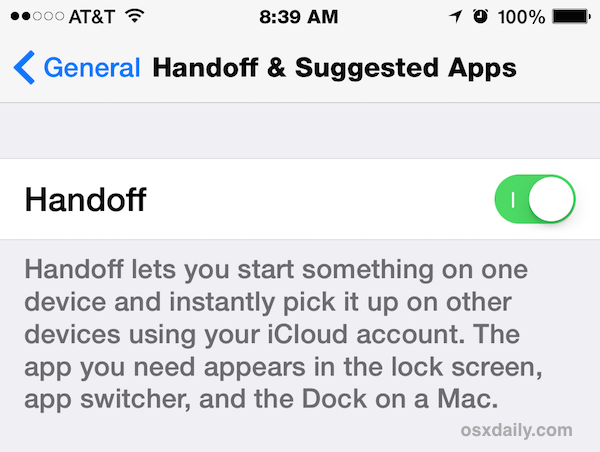 What has been your experience with Handoff? Do you love it? Does it work for you? Let us know your experiences in the comments! Handoff works flawlessly between iPhone 6 and a new-ish 2012 MacBook Air, all the time, both ways, just as advertised, a very cool experience. But then it’s much less consistent on older devices, but kind of like you mention, it still works sometimes but it’s seemingly random. I can usually trigger it on the problematic older Mac by turning bluetooth off and on again, then suddenly it works, but only for a session, then I have to do the same thing again to make it work again. I think Handoff and Continuity (what is it actually called?) will be like AirDrop, if you remember the first versions were a bit unreliable but after the system updates it became 100% reliable. They probably need to strengthen the discovery process and then it will work all the time. I got handoff to work once. One time. From iPhone to MacBook. Just once, that was it. Yosemite is half baked, like a baked potato in the oven for 10 minutes and everyone is trying to butter and pepper the thing. Well, it is not done cooking so of course OS X Yosemite is going to taste like a raw potato. Is this the public beta? Right? I could not get hand-off or for that matter, Airdrop, to work on my 2013 MacBook Air and iPhone 6. I was confused by thinking I had to pair the two with Bluetooth (you don’t). I called Apple support and within about five minutes he had me up and working and explained how to use it, etc.. It has worked 100% of the time in both directions since then. I like it. No need to pair with Bluetooth, just needs Bluetooth 4.0 to be active (not sure why since the session is passed through wi-fi). What did the Apple Support rep tell you to do? I have not had it be consistent at all, Handoff is like a coin toss for me. If both devices need to be on the same Wifi network, why is Bluetooth also needed? Having two radios instead of one just uses more battery. Great question, why does the Mac need Bluetooth 4.0 at all? Why is there any limitation on this? It seems like a simple idea that they over engineered a solution two with DUAL radio requirements. You would have to ask Apple why Handoff requires Bluetooth and Wi-Fi, but you’d think with two radios they could make it work consistently. Me personally, I have had Handoff work like twice and it’s at random, I’ve never been able to trigger it intentionally since then. I beleive BlueTooth is used so the two devices know when they are near each other. I can walk halfway down the block from my house with my iPhone and still be on my Wifi network, so that’s no indicator of where I am in relation to the Mac. It seems one of the issues is when you have more than 2 devices running on the same network. I had 2 macs and iPhone and handoff got jammed and never worked between either of the macs and the iPhone. That was until I realized the IMac was taking priority and somewhat blocked the MacBook Air. I turned off the iMac and then, miracle, handoff worked like a breeze between the Air and the iPhone. Another bit of info: handoff is not available for iPad3. I’ve used it a bit. Bugs I’ve come across is answering my call on… my phone and the Mac still ringing the whole time I was talking. And another time answering the call on the Mac with the ringtone still ringing in the background of the conversation. Had to call that person back. It’s worked great most of the time. 1. Changing the name of the iOS device in General -> About and then rebooting both devices fix the issue 90% of the time. 3. If you reboot both devices and it still doesn’t work, regardless if you are using bluetooth connected apps or devices, revert to #1. One addition – once you reboot your phone or iPad make sure you unlock it with your passcode first. You don’t need to keep it unlocked, just once after reboot. In my office, my MacBook is connected to the network through Ethernet (using the Thuderbolt connection to my Thunderbolt Display that servers as a docking station). I also always had my WiFi open too and I therefore used to have 2 IP addresses assigned to my computer on the same network (the same router that has the Ethernet wired connection to my Mac has the wireless WiFi). Handoff never worked well until I realized that I need to turn off one of these 2 connections. 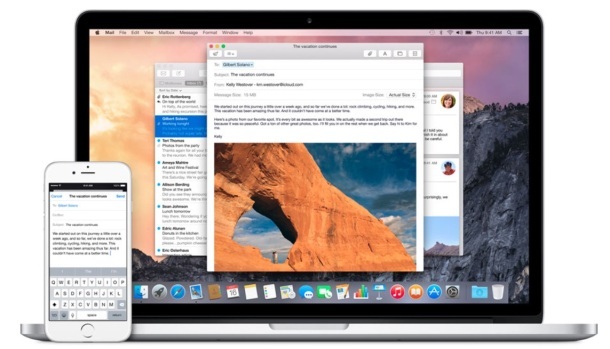 The handoff usually works on my Macbook Air and iPhone 5s 70% of the time (only for Safari, Messages, Mail apps). Pretty much the worst feature ever! Has added NO VALUE to my life whatsoever and had caused MAJOR Bluetooth issues with all of my connected devices (wireless mouse, keyboard and trackpad), constantly disconnecting and eventually Bluetooth connectivity completely die. I’ve had to spend countless months with major Bluetooth issues BECAUSE of this feature. Went through hours of rigmarole with Apple Support trying to troubleshoot it (resetting bluetooth software settings, deleting p.list files and reinstalling the OS to death) and I’ve even had to have my new IMAC’s Bluetooth and wireless module and entire motherboard completely replaced. AND it has NOTHING to do with Bluetooth, just this irrelevant software feature. The fact that this feature is ON by DEFAULT is going to cost Apple MILLIONS of dollars in wasted money and technical support because of this stupid feature which clearly has ISSUES and is a systemic cause for customers assuming the issue is with Bluetooth. Whichever team worked on this, invest a bit more in your QA before causing many customers and Apple’s wasted time, money and grief!